Inspiration will take you to some interesting places . . .
A recent evening in I decided to crack open this bottle of Roditis. It’s not a pricey bottle, but it inspired quite a feast. Admittedly, I already had the calamari hanging around in the freezer, but still, I ended up with a much more elaborate meal than I’d expected. And that is the fun of these experiments–to see where it all goes! I wasn’t all that familiar with Roditis. 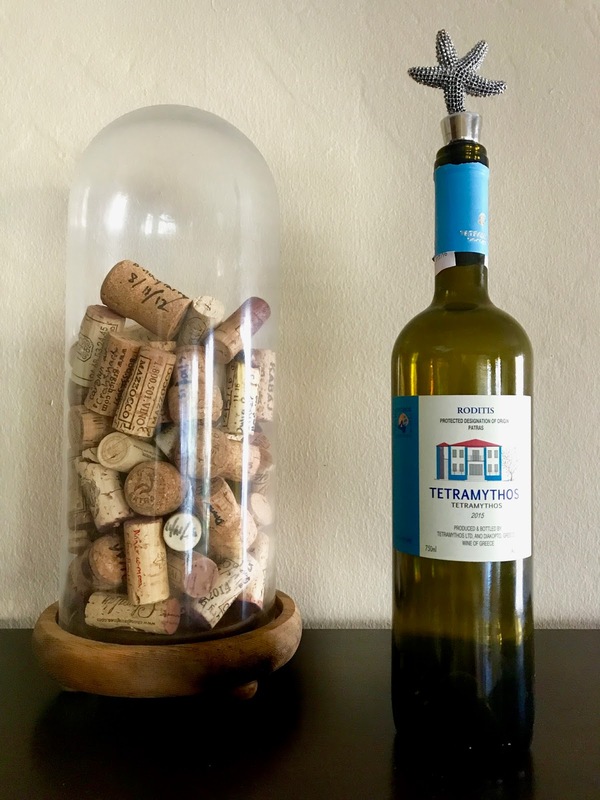 I like Greek wines a lot, but more often than not, it’s an Assyrtiko from Santorini that I reach for. I’m going to guess that if your drinking Greek wines, that’s probably where you’re reaching for most of the time as well. It’s always fun to branch out, and one of the great things about wine is that every now and again you can have an adventure for under $20. Moving on, this grape (or grapes) is grown all around Greece, but most particularly in the Patras region of the Peloponnese Peninsula. If you’ve ever had a Retsina this grape was very likely part of the blend, along with Savatiano. Not that you’d have any idea what either of those grapes tasted like beneath all of that evergreen flavor. If you’ve never had a Retsina, it’s flavored with pine resin and basically tastes like you’re drinking a Christmas tree. Strip away the pine and it turns out that there’s a really delicious wine hiding underneath. The Greeks have been drinking the dry, crisp, un-pined expressions of Roditis for quite sometime; however, WineSearcher.com only shows a handful of examples currently available in the US. That might need to change, because the version we tried was so refreshing and delicious. I don’t mean to suggest that it was a crazy complex, thinker of a wine; but it was super drinkable and food friendly and really reasonably priced. 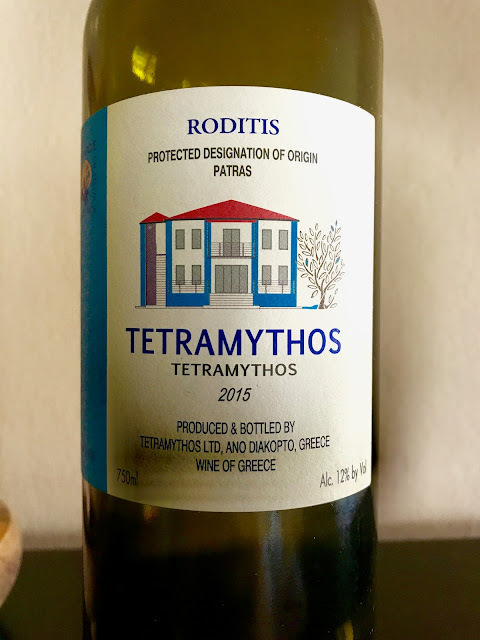 The bottle we opened on this particular evening was the Tetramythos Rodits Patras 2015. Greg and I picked up tons of citrus on both the nose and palate––all the parts of the lemon were in there, from pith to juice–along with grapefruit. There was also some richer lemon curd. There were also notes of snappy green apples and a little saline minerality. Light, fresh green herbs like lemongrass and parsley danced in the background and added interest to the finish. Despite all these crisp flavors, the wine was also textured and had body. This would be a beautiful thing to drink seaside with a big plate of fried seafood. Calamari with a squeeze of lemon? Hell yeah that’d be awesome with this wine. And like I said, I did have that frozen squid hanging around in the freezer. However, those herbal notes lead me a couple of steps further beyond just deep frying the calamari. I regularly blend up green herb sauces using leftover herbs and greens. (I recently wrote these up on NibblingGypsy.com) I was overdue to make a batch of salsa verde and thought it would make a great complement to those green notes. For the squid itself, I was inspired to riff on a stuffed calamari dish we served in my culinary school’s restaurant. (Sadly, L’Ecole has since closed.) 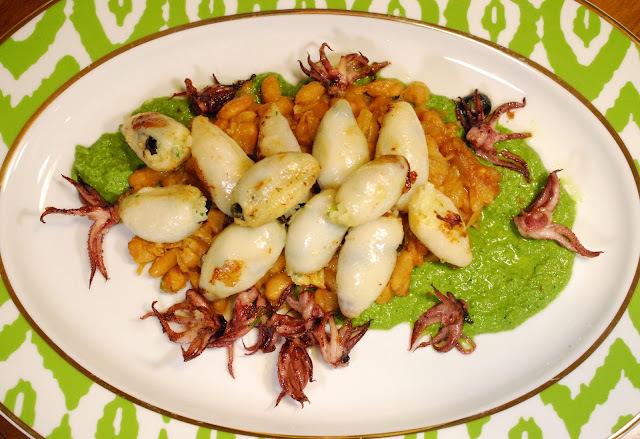 The beauty of this dish is that even though it looks fancy, it makes use of a lot of pantry staples–well, other than the calamari. I also had rice leftover from a previous evening and this was a great way to use it up. If I’d wanted to present these more elegantly, I probably should have put a little spoonful of the beans and a dainty swoosh of the salsa verde on the plate. I like a lot of sauce though; so instead I just mounded up the beans and let the sauce flow freely onto the plate. Boom! It turned into one very tasty evening. The salsa verde worked as I’d hoped with the green notes in the wine and the citrus notes in the wine worked beautifully with squid. Also, thanks to the wine’s body and texture, it was able to handle all the weightier elements on the plate. Tetramythos was started by two brothers–Aristos and Stathis Spanos. They grew up near the vineyards they now own. They grow both olives and grapes and farm everything organically. 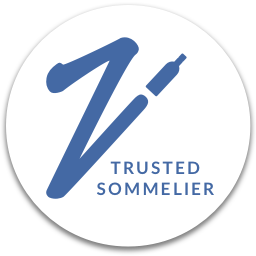 The vineyard sites for this wine are located between at 600 and 1,050 meters above sea level. I couldn’t find many details on the winemaking for this specific wine, but you can see the tech sheet here. It is 100% Rhoditis and aged for two years before release. WineSearcher.com has the average price on this wine across all vintages at $13. (I bought my bottle at Bay Grape.) I absolutely thought this was an Overachiever and a wonderful House Wine. This wine was so refreshing and had that nice body–I really think that combo will make this wine a good match for so many dishes. It is a natural match for seafood (particularly for grilled or fried options) but would also work with lighter chicken and pork dishes. 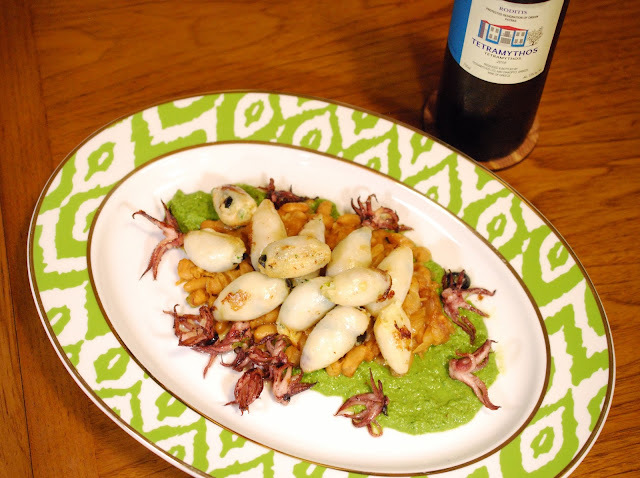 As for the calamari, look for white wines with lots of citrus, snappy acidity with some body to stand up to all the components, and an herbal edge to match the salsa verde. All in this probably took around 90 minutes, give or take. It makes about 6-8 dinner servings, or about double the amount of appetizer portions. Prep tip: I make these beans as a side to go with many other things, so I’ve broken out the recipe. 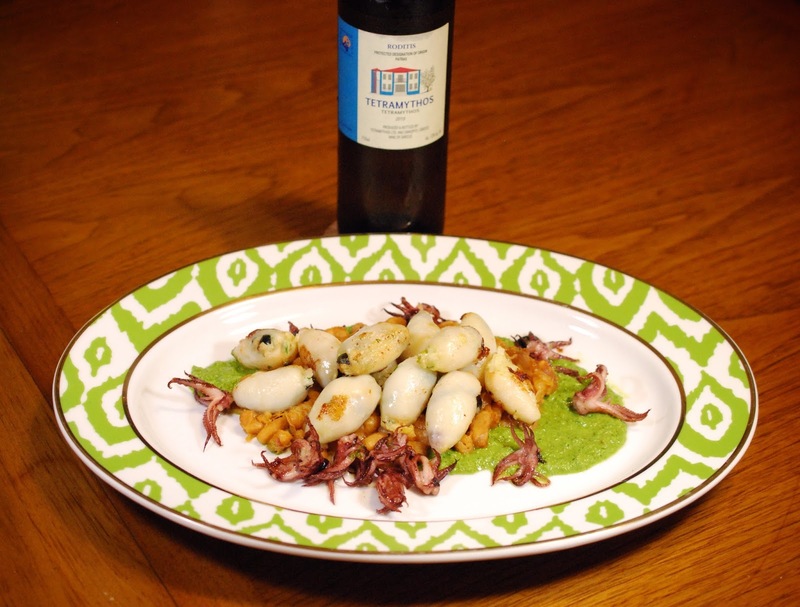 If you’re making the beans to enjoy together with the squid, sweat all the onions and garlic together, then divide in half for the two recipes. 2. Heat a small amount of olive oil in a sauté pan, add and cook the pancetta (If using) until lightly crispy and light golden brown over medium-high heat. Transfer the pancetta to a separate dish. 3. Return the pan to the stove and add a little more oil if needed. Sweat onions over medium heat. Add in the garlic and season with a little salt and pepper. Cook until the onions are translucent and completely soft. 4. Combine the onion, pancetta, prepared rice, black olives, parsley, and the capers. Taste and adjust seasoning. Once the mixture has cooled down a bit, stir in the whisked egg. 5. Keeping them in one piece, turn the calamari bodies inside-out. This will help the calamari remain closed while cooking. Reserve the tentacles for later use. 6. Fill the inverted bodies with the rice mixtures, leaving ½ cm (¼ in) of space at the top of each one. Note: If you have access to a pastry bag, using it to fill the bodies with the rice mixture can be helpful. If not, spoons and hand will work just fine, if a bit more messy. 7. Heat butter in a sauté pan over medium flame. (Combine with a little olive oil if desired.) Working in batches, sear the stuffed squid bodies, rolling them in butter/olive oil, and basting continuously for 2-3 minutes until lightly golden. Transfer to the oven for 2-4 minutes to finish. 8. While the calamari bodies are in the oven, pan-fry the tentacles in the remaining butter and olive oil if desired. 1. Sweat the onions in a sauté pan in a little olive oil over medium heat, seasoned with a little salt and pepper. 2. Once the onions are soft, add in the garlic and the cannellini beans and sauté until cooked and heated through. 3. Stir in the Parmesan and season with salt and pepper to taste. Keep the beans warm until ready to serve. 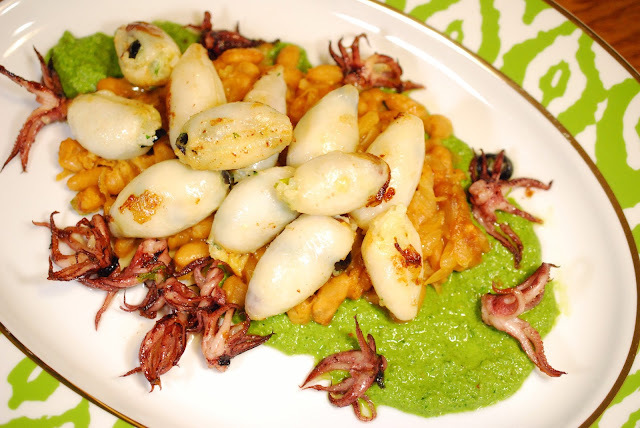 Photo credit for all the calamari pictures to Greg Hudsons. So the amount of rice stuffing I made would have been perfect for approximately 2 lbs of squid. That would’ve been great if I’d been making them for a party, but that seemed too much for Greg and I to eat in one dinner. Given that, I saved half the stuffing and made stuffed tomatoes to have as a side with dinner a couple of nights later. 1. Cut the top of each tomato. Scoop out the insides (save the pulp for another use if desired) leaving about a 1/2-inch of the exterior. 3. Place tomatoes in a greased baking dish. Bake at 350° for 30 minutes until the tomatoes are soft, the filling is heated through, and the cheese on top is lightly browned. Check on the tomatoes about 20 minutes in and cover with foil if cheese is browning too much.